Dentures should be brushed inside and outside when needed with a soft, large nylon denture tooth brush with round-ended bristles. 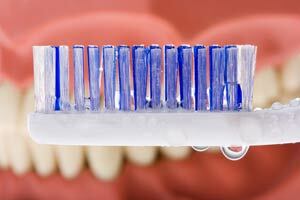 We will provide you with an appropriate brush when your denture is complete. Use dish soap instead of toothpastes, which are too abrasive and will scratch your denture. When not in use, cover dentures with cool water or a denture-cleaning solution to prevent them from drying out.